The project was carried out as part of the ZPORR program. The School Youth Hostel in Pawełki welcomes you. The project consisted of ‘Extending, refurbishing and equipping the building of the youth hostel in Pawełki, including the development of the recreational grounds around the hostel’. The project was jointly financed by the European Regional Development Fund and the Polish state funds from ZPORR (Integrated Regional Operational Programme for the development of rural areas – tourism). ERDF covers 75% of the qualifying costs, in this case 1,958,398.38 PLN, 10% or 261,119.78 PLN is covered by the Treasury and the reminder is contributed by the local borough (gmina) council. Gmina Kochanowice Office telephone number: ++ 48 34 3533100 02. 60 beds in 2, 3, 4, 5 and 6 bed bedrooms/dorms, including 4 twin rooms with en-suite facilities. 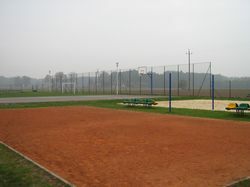 Sports facilities: tennis, volleyball, football, basketball, beach volleyball. Pawełki can be reached by a PKS bus from Lubliniec, 12 km away; walking (use the yellow trail) from the PKP railway station in Ciasna, 5 km away; or from a bus stop in Kochcice, 4 km away. The hostel is an ideal location for combining rest and recreation with educational activities in the natural environment. The trail ‘To the Birch’ (‘Na Brzozę’), opened in 2003, makes the latter easier. The forest trail starts at the forest keeper’s lodge in Lubockie and ends in Pawełki at the School Hostel. On the way you will encounter a unique monument of nature – almost 100-years-old rhododendrons blooming in the middle of a pine forest – best admired from an adjacent viewing tower. Brzoza pond jetty gives a chance to see swans, cranes, ducks and black storks, and there is a place for a bonfire there too (ask the forest keeper for permission). At the hostel, you can organise sport and recreational activities, from volleyball competitions to discos to bonfires. The hostel is located next to the 1933 church of Our Lady of Fatima. We extend a particular welcome to organisers of Green School outings that last several days. The photos below show the hostel and its surroundings. The hostel offers self-service kitchen as well as catering by arrangement. 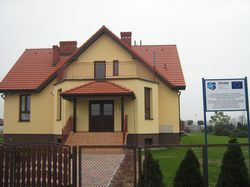 The nearest canteen facilities are at: Ciasna (5 km), Kochcice (at Wojewódzki Ośrodek Rehabilitacji, 3 km); Lubecko (7 km), Kochanowice (9 km). Our hostel awaits shorter tours, Green Schools, holiday camps and sport-focused camps. The sports facilities at the hostel, combined with the indoor facilities at Kochcice 4 km away make it possible to use the hostel as a base for training camps. The beautiful wooden church next door makes it a good location for a holiday organised by Catholic associations. Our meeting facilities make it suitable for off-site training courses and conferences. We offer discounts to larger groups. We welcome individual visitors and organised groups, for shorter and longer stays.